Silent Gliss Wave is an exciting and contemporary curtain heading system which gives the effect of eyelet heading but allows the curtains to hang below the curtain track in continuous wave which is smooth, simple and elegant. 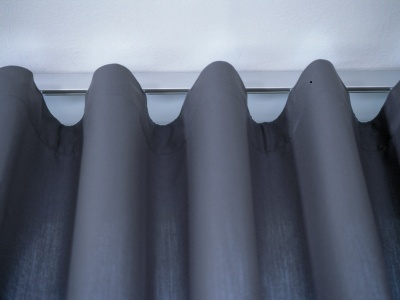 The wave gliders automatically space your curtains by using the clever 'glider cord' design to achieve a very uniform appearance that is not always possible with eyelet headings. The wave glider cord is added to the track during manufacture and is available in two sizes 60mm for smaller waves particularly suited to voiles and lighter weight fabrics and 80mm for larger waves suitable for heavier lined curtains. With the exception of the Metropole system 1003M the wave heading system is available on system Autoglide 5100, 5100R, 5100T, 5100T, 5600 and 5600R and Metropole & Metroflat System 6100M, 6120M, 6130M, 6140M, 6150M, 6160M. Any tracks ordered with either 60mm or 80mm standard wave gliders will come complete, ready-assembled with glider cord and will be sent with appropriate brackets to compensate for the wave. Wave gliders can only be used in conjunction with Silent Gliss approved wave heading tape (6349) which can be purchased separately (please see accessories). Enhanced wave components are available at additional cost, please contact us for a price. For hand drawn tracks, to prevent the leading edge of your curtain(s) creeping forward in the open/stacked back position or closed without any light seepage an adjustable brake can be added to the track during manufacture. This is available to buy as a single component for retro fitting or as an optional extra when ordering. Please be aware if you are having curtains made to fit your chosen track you will need to know the length of wave heading tape (i.e. number of glider pockets required for your exact length of track) as this will determine the width of your curtains. We will happily calculate this for you, either contact us by email or call 029 2036 1933. Please contact us by email or call 029 2036 1933 us if you need more information.